Do you remember that old song? The original song title said "Girls" instead of "Boys", but surely you can recall it, right? If you've never heard it or just need a little walk down memory lane, go ahead and click the link. Oh come on, you know you want to....I'll wait right here. I dare you! For some reason this song from way back came to my mind the other day. It actually came out around the time that I was in an "extremely serious relationship" with my first boyfriend. Oh, he had the cutest buck-teeth and curly hair. Besides my Daddy and brothers, he was the first boy that I loved. Or so I thought. We met in Kindergarten and although I forget the details, we decided we would be boyfriend and girlfriend from that day forward. And so we were. For six years. I'm not even kidding. I have no idea what that even meant back then other than we told a few people here and there and were generally nice to each other in the housekeeping center. There was that one time that our families happened to be vacationing at the same time in Myrtle Beach. He invited me over for a day of playing on ocean rafts and eating out with his family that evening. The only real memory I have from that day is that his parents ordered us baby steaks when the rest of the family ordered big people steaks. We were completely offended as we were clearly not babies. After all, at this point in our relationship we were at least ten years old! Soon we went to middle school, and that old flame died. It was soon replaced by a new middle school love. I was only in 6th grade when I became smitten with an upperclassman. That's right friends...he was a 7th grader. Blonde and freckle-faced, he let me know he liked me by pulling out my hair ribbon and running away to class with it. You can bet that I wore extra ribbons every day so he would always have one to steal. By the next year, I got to move to the same hall, and that's when the true romance began. He even brought me the cutest little Valentine bear. Folks, we were officially "going together". I'm not sure where we were going other than ballgames where he played and I cheered. Nonetheless, we were official. Until he broke up with me right before his prom to take another girl. I. Was. Heartbroken. He went on to high school, but he would still call me occasionally and come to the middle school games to flirt with me. Apparently, I'm a hard habit to break. Ha! Eventually, that love withered too. All through high school, I had crushes on a few different boys. I seem to remember a "good ol' farm boy" on my bus who liked me, but I wasn't interested. I went on a few dates but didn't really have a serious boyfriend during that time. It was just as well I suppose since I was keeping myself busy with the one million clubs to which I belonged. Truth be told, I was President of most of them. I guess I wanted to be in charge way back then just like I do now. I'm bossy like that. In college, there was this guy I knew from high school who I hung out with all the time. We always said we were just friends, but we never dated anybody else and pretty much spent all our time together. At some point, we acknowledged that yes, we were in fact dating. There was only one problem. He loved fish more than me. Remember that Brad Paisley song? I'm pretty sure it was written about us. I didn't have to compete with any other girls. Just fish. And the fish always won. It didn't really matter anyway because we both knew we were better off friends anyway. He wished me well. I wished him and his fish well and closed that door. While I'm sure I'm forgetting a few, the list of all the boys I've loved before isn't that long. I'm so thankful for that. While I waited for the one boy I'll love forever, Jesus protected my heart. He brought Brian into my life at just the right time. However, He taught me lots of lessons through all the boys I loved before. When somebody asks me how I knew Brian was the one, I usually explain how it just felt easy. I wasn't waiting at home while he was fishing. He wanted to be with me as much as I wanted to be with him. I wasn't second best. Ever. I could go on and on with reasons how I knew he was "the one", and a lot of those were based on lessons I learned through the years with those who were never supposed to be "the one". 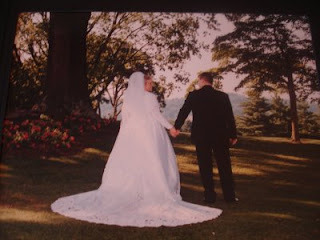 Brian and I just celebrated our 15th anniversary on July 1. Those boys I thought I loved...they all turned out to be really great men. I'm still friends with most of them and enjoy seeing their families on facebook or around town. But for me, none of them even come close to the man I get to love forever. So I'm thankful for all those boys I THOUGHT I loved before. God used them to show me my one true love. Happy Anniversary Brian!